Directions on Natural Hog Casings. Learn How To Use Hog Casings. How to store, prepare and use natural hog casings for stuffing your sausages at home! SPECIAL SALE Until Midnight, Sunday, August 10 - Receive $30.00 Off Any Order Over $150.00 - Use The Coupon Code 30150. Our Phone Orders Are Accepted 9:00 a.m. to 4:00 p.m (CST) Monday through Friday. Heavy or Bulky Items May Be Shipped by UPS. We Also Accept Checks & Money Orders by Postal Mail. Click Here For Our Special Sale! You may notice that other Web Sites DON'T Even Mention The Brand Of Hog Casing They Sell! The DeWied Brand of Hog Casings are the ONLY brand of Natural Hog and Sheep Casings we have ever used! Our hog and sheep casings are shipped un-refrigerated. They are perfectly safe shipped this way. They do not need to be refrigerated until the package is opened. The DeWied Processor Pack™ brand casings in the Hank Size are made to the highest quality standards at DeWied. Natural Hog Casings Are Best used for Fresh Sausage (such as Bratwurst, Pork Sausage Links, Kielbasa etc.) AND - they CAN be smoked. We Now Have Fresh Sausage Kits. Includes seasoning, natural hog casings and instructions. Everything you need to make a 25 lb. batch or 100 lb. batch of sausage at a DISCOUNTED price! Processor Pack™ brand casings are made to the highest quality standards at DeWied. Perfect for Bratwurst, Kielbasa, Italian Sausage, Cajun Links and many other sausages! Home Size Pack will stuff 20 to 25 lbs. of sausage. Hanks Packaged in Preflushed Vac-Pack. The Same as Bratwurst at the store. These casings are Premium Commercial Processor Grade Casings and you can add smoke flavoring to them before cooking! Natural hog casings stay fresh up to 1 to 2 years in your refrigerator!! We ship our DeWied Natural Hog Casings un-refrigerated. They are shipped to us un-refrigerated also. They are perfectly safe this way during the short time of shipping. Just place them in your refrigerator when you receive them and they will last for 1 to 2 years stored this way! Click here to see our Witts Smoked Beef/Deer Sausage Seasoning that we use with our Fibrous Casings. Click here to see our AC Legg Snack Stick Seasoning that we use with our Collagen Casings. Click here to see all of our Fresh Sausage Seasonings that we use with our Natural Hog Casings. Learn how to store, prepare and use natural hog casings for stuffing your sausages at home! To stuff sausage into the Natural Hog Casings, we recommend using the Dakotah Water Stuffer. We feel that the Dakotah Water stuffer is the BEST stuffer to use at home! ONLY $149.97 - and Shipped FREE in the U.S. Check around - We think you will find this is the lowest price ANYWHERE! How do you soak out casings and for how long? How long do you smoke sausage? How do you keep unused casings? How tight should the sausage be stuffed? What is the shelf life of natural casings? What is the best way to store natural casings? What is the most popular size casing for a fresh and smoked sausage? My casings smell bad; are they still good? What can I do to knock out the bad smell in my casings? What can I do to improve the bite on the casings? What is the length of a bundle or hank of casings? How many strands should a bundle have? Why is there such a difference in price between companies when casings seem the same? Why are the casings tough after cooking fresh sausage? How can I make my casings more tender? What is the webby looking spot on my casings? What is the difference between hand pulled and knife cut casings? How do you twist the casings into links? Order Your Natural Hog Casings Today! For best results soak over night in cooler in water that starts out at 90º F (32.2ºC). If in a hurry, follow these instructions but understand that you may not get maximum expansion capacity from the casing. Rushing the soaking process can result in the casing being sticky and they may not slide easily from the horn. This can result in breakage and sausage that is irregular in diameter or too small. The length of your smoke cycle becomes part of your sausage formulation. Your smoke cycle depends on the type of smokehouse you have and the type of product you are smoking. Contact your smokehouse supplier. DeWied FLAVOR FRESH colored casings can help shorten your smoke cycle to increase smokehouse productivity. Cover unused casings in brine solution or granulated salt and store in cooler at 40º (4.44ºC) or less but do not freeze. How tight you stuff sausage casings depends on the type of sausage and how it is to be linked. For natural casings: When making a rope sausage, without linking, stuff to slightly less than the maximum expansion of the casings. If linking by machine, stuff 3-4 mm below the maximum expansion of the casing. Consult the instructions for the linker or your linker supplier because there can be significant differences in equipment. If linking by hand stuff 4-5 mm below the maximum expansion of the casing. Hand linking can put uneven stress on the casing. By under stuffing, you can reduce breakage during linking. Check the firmness of the link and adjust the stuffing pressure. Preflushed in Net Pack: 6 months to one year. Preflushed on plastic Tubes: 6 months to one year. Colored Casings: About 6 months. Store in the cooler at 40º (4.44ºC) or less in brine or well salted. NEVER freeze casings. There are no standards dictating the size casing to be used for a particular sausage. The size casing you use for sausage should depend on what you want your sausage to look like. The specification of the packaging and above all, the preference of the customer will influence the casing size . How many links do you want to make up a pound? How long must the links be for the packaging to be used? IE: 5 links per pound(436g) and 5 inches (127mm) per link. 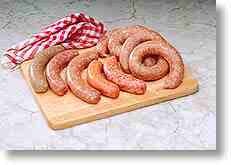 Traditionally, smaller sizes are used for fresh sausage and larger sizes for smoked sausage. See the size guidelines recommended in the sections of this web site for fresh, smoked, cooked, dried and deli sausage. Usually Yes. When your natural casings first arrive there may be some gas build up in the container, especially in hot weather. This can smell pretty strong. Kind of like a crowded room of bean farmers after a bean banquet. They are still good people though! Usually all it needs is airing out. Leave the container open in the cooler for a while. Or, take casings out of the container and air them out. If it is really bad, rinse casings in fresh water, re-soak in brine and the smell will usually dissipate. If odor persists, call your DeWied account executive for assistance. Cooking a sausage can toughen any casing. To maximize the tender bite of a casing, cook with moisture. Prick sausage before grilling. The traditional hank or bundle of hog or sheep casing was 100 yards. However, today there is no standard length. Some suppliers will base the length of the casing bundle on the price a customer demands. Now there are some casings like DeWied Processor Packs that will make about 100 pounds (45.3kg) of sausage no matter what size you use. That’s important for planning batch requirements and costing. The number of strands in a bundle depends on how uniform the diameter of the sausage must be and how long the individual strands of casing must be. The fewer strands and the longer they are, the less uniform the casings will be. In general, a hog casing will have 14-18 strands and a sheep casing will have 12-14 strand. Price is contingent on type or origin of the casing, the diameter size range, number of yards in a hank or bundle, the amount of sausage that can be made with a casing unit, the number of casings actually shipped and invoiced, and quality factors of the casing. The world market for casings will affect pricing in a regional market. Here are three steps to help identify some basic reasons for price differences between casing suppliers. - Know how much sausage your casing unit makes and compare. - Count the number of casing units received and compare with the invoice. - Observe subtle differences in casing characteristics that effect quality. - Sausage was cooked in a pan too hot and too quickly. - Casings were not soaked long enough. This is a patch of peyer (Pie-air) which is scarring resulting from the cleaning process and the removal of lymph nodes. All natural casings will have some scarring. North American hand pulled casings do not have threads of connective tissue on the outside (Called whiskers). They are delicate and usually have shorter strands than knife cut. They may have more holes or weak spots. Knife cut casings have the small threads of connective tissue (Whiskers). They have an extra membrane for strength. Their strands are usually longer and have fewer holes. The threads of connective tissue on knife cut casings will melt off on smoked or cooked sausage. Slowly pinch the casing where you want a link to start, and twist the link clockwise. For the next link, twist counterclockwise; then clockwise again, and so forth. Be very gentle, or you'll burst the casing! Is there something you've read on this page you don't understand - or not quite sure what something meant? Do you still have questions that weren't answered after reading something on Ask The Meatman.com. Then Click Here to Ask The Meatman A Question!